Discover the joys of home cinema with an Epson projector. Unlike large TVs, a projector doesn’t demand a huge chunk of wall space until you need it and, when it comes to big screen thrills and spills nothing can match the authentically cinematic experience of a projected image. Take our word for it, once you’ve equipped your living room with an Epson projector you’ll want to re-watch all your favourite films to experience them in full cinematic glory. A home cinema projector will also change the way you watch sport – imagine getting your mates around to watch the big game on a 100-inch plus screen! 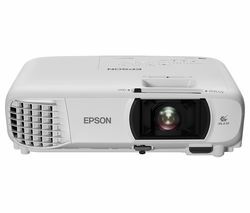 Our collection of Epson projector ranges from accessibly priced entry-level models like the Epson EB-X31 Projector, a model that’s nonetheless capable of delivering incredibly crisp, vivid images thanks to its 3,200 lumen brightness output and a fantastic contrast ratio of 15000:1, to top of the range projectors like the feature-packed Epson EH-TW6100 3D Home Cinema Projector. This high spec projector even provides immersive 3D viewing at the touch of a button. 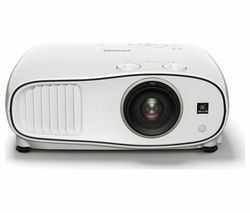 Browse our complete collection of home cinema projectors, including the latest Optoma and Phillips projectors.